A wooden fence is an attractive addition to your landscape, whether it surrounds the front of your property, enhancing the curb appeal, or the back of your property to give you privacy and keep your animals and children safe. If you want those fences to stand out, and to add decorative and architectural interest to your property, then you should look at our gorgeous white 6x6 post caps in the plateau or flat top series. 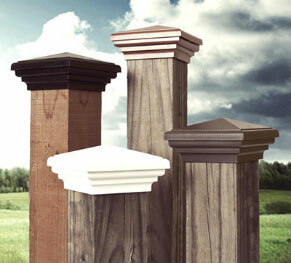 Our ASA resin white flat top fence post caps are unique for several reasons. ASA resin is a hard plastic that is the same material that car and marine vehicle manufacturing companies use. We chose that material because of its impact and UV resistance, and because it’s much stronger and more durable than wood. We believe so firmly in the superiority of ASA resin that we give you a 10-year guarantee against damages related to discoloration, fading, and warping. Our ASA resin fence post caps are superior to wood in just about every way. The unique design keeps the top of your fence posts dry, so there’s less chance that the saturated post tops will rot or get moldy. Our resin post caps don’t contract and expand with humidity changes, and wood does. All of our fence post caps, including our beautiful and most popular flat top series, cost much less than comparable wood models, and ours last far longer - without any maintenance. We are proud of the fact that we manufacturer all ASA resin post caps in the United States. The white flat top 6x6 post caps come in two sizes: Nominal (also called Standard), and Actual (also called True.) Long ago before lumber mills had precision machinery that expedited the process of drying wood before cutting it, timber was cut when it was green (still moist.) But it had to dry before it could be used for building. Since drying removes the moisture, the result was that after posts were dried and finished, they were smaller than the intended size. Actual (or true) refers to posts that are kiln dried before they’re cut. If a post was supposed to be a 6x6, then it was cut to those measurements. The standard (or nominal) white flat top 6x6 post caps will fit posts whose measurements fall between 5.5” x 5.5” and 5.75” and 5.75”. The true (actual) white flat top 6x6 post caps will fit posts that are between 6” x 6” and 6.25” and 6.25”. Our patented SNAP-CAP system makes installation a breeze.